Many eminent scientists, artists, painters, economists, teachers, athletes and other specialists were born, studied and worked in Koknese, spending a smaller or larger part of their lives here. Vetseke (Vesceke, Vyachko; 12th century – 1224), ruler of Koknese, later of Tērbata. Concluded peace with Bishop Albert in 1205. 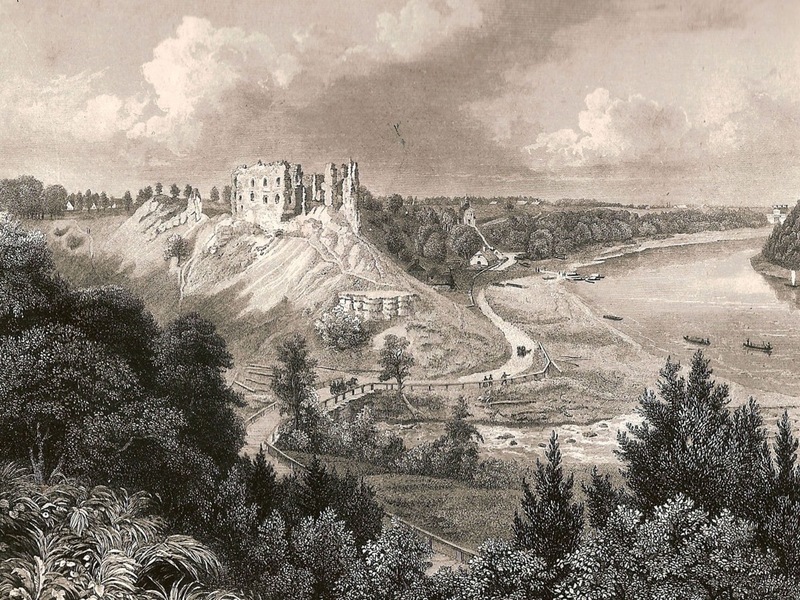 In 1208, burned down the Koknese castle and went to Russia. Bishop Albert – in 1209, gave orders for building a strong stone wall castle in Koknese. Since the beginning of 13th century, Albert ruled German feudal and Catholic church expansion in the Baltic States. Rūdolph von Jerichow – manager of the Koknese castle from 1209 to 1211. Born to a wealthy ministerial family in the Magdeburg archdiocese. Took part in a crusader attack on Jersika. Tyzenhaus – in Koknese was ruled by the Tyzenhaus family from 1269 to 1395. Stephen Bathory – gave privileges to Koknese citizens – gave land beyond town walls, allowed to keep barges. The privilege given by the king in 1597 allowed the townspeople to have their own boats and sailing devices, promoted renewing of Catholic faith as a means to add the region to Poland–Lithuania. Carl of Sweden (later Charles IX) – in September of 1600, went to Estonia and took over almost all of Vidzeme. On March 23, 1601, Koknese was surrounded by Carl. On May 12, he was defeated by the Poles. On September 27, 1605, Poles defeat Carl’s army in the battle of Salaspils. Gustavus Adolphus of Sweden (1594–1632) – on August 27, 1621 occupies Koknese. King of Sweden, an excellent commander. Reforms Swedish public administration, court, supporter of town development. In foreign policy, he tried to establish dominance of Sweden in the Baltic States, took a part of wars with Poland and Russia in Vidzeme and Rīga. Gustavus Adolphus was a reformer of the art of war. Tsar Alexei Mikhailovich occupied Koknese in the September of 1656. Saxon colonel Bose gave orders to blow up the Koknese castle and retreated to Kurzeme on July 25, 1701. Ernst Gluck (1652–1705), Baltic-German priest, writer, priest of the Koknese district. Trained around 25 teachers for the Koknese district in the Aluksne Parochial School. Together with assistants Ernst Gluck, translated the first edition of the Bible in Latvian (1685–1691). The Bible secured standards of literary language and had a powerful impact on the creation process of Latvian literature. Julius Fedders (1838–1909) considered to be the creator of Latvian landscape painting in the second half of the 19th century. A characteristic representative of Russian and German academics, realistically romanticized school, some trends of realistic impressionism in his work. Born in Koknese to the family of a local pub owner. Late 19th century and early 20th century, J. Fedders painted a lot of nature paintings depicting the most beautiful places of Latvia, mostly Koknese and Sigulda (‘Road in Līgatne’, ‘Sigulda castle pond’, ‘Park in Sigulda’). Alexander Strahl (1879–1947) born to the family of a Daugava raft man, tanner. Spent his first school years together with his brother Kārlis in the Koknese Orthodox Parochial School. Focused mostly on landscapes and everyday life when painting, preferred realistic impressionism. Researched the influence of atmosphere and light effects in painting. Lyrical, sorrowful landscapes with staffage. Raft men, log transporters, craftsmen in their usual environment, rigorous but harmonious Latvian nature were his key sources. Konrāds Ubāns (1893–1981), one of the greatest Latvian painters. The master of tonal painting. Painted portraits, landscapes, nudes and still life. He painted specific places in the nature, saying that the direct, lively and emotional feeling of nature is the most significant aspect. His favourite landscape themes were the outskirts of Riga, Pārdaugava, Koknese and Pērse. Rūdolfs Kārlis Leonīds Blaumanis (1836–1908), author. First publications in German. From 1885 to 1887 was the clerk and manager apprentice of the Koknese manor. Koknese people became the prototypes for the characters of his work, in the novel ‘The Swamp Treader’ and the play ‘In Fire’. Juris Dauge (Georgs, 1835–1910), writer and teacher. Born in the family of an innkeeper in the Koknese Post manor Kancler pub. Went to the Jaunjelgava Elementary School, Koknese and Ikšķile Parochial Schools. Active promoter of culture and social life. One of his most important writings was the story “The Maiden of Turaida” (1857). Jēkabs Karps (1865–1943), the archbishop of Latvian Orthodox Church in Jelgava. Did publishing, published his compiled calendar for Orthodox Church. Actively participated in the events of the 1905 Russian Revolution, Jēkabs Karps was one of the leaders of Latvian Orthodox Church in the 1930s, he often met with K. Ulmanis. He became the archbishop in 1942. Jānis Kroders (1860–1938), member of the revolutionary movement, initiator for establishment of several farming, charity and cultural associations. In the May of 1905, became a clerk in the Koknese parish. During this time he actively participated in meetings and demonstrations organized by Social Democrats. The excellent competence, fearless public address against tsar’s government and noblemen made him one of the leaders of the revolutionary movement in Koknese. Pēteris Peņģerots (1888–1906), member of the 1905 Russian Revolution. Servant at the Koknese rectory. Entered the militia and participated in battles with tsar’s army. After the punitive expeditions came, hid in the Bebri parish Jauneļi together with other revolutionaries. He was arrested on the orders of the Koknese priest Hilner. Tortured while incarcerated, shot in 1906. Jēkabs Pilsātnieks (1838–1879), poet. Born in the family of the tenant of a manor mill in the Taurene parish. Attended Jānis Cimze teacher seminar in Valka (1859). Teacher in Vecpiebalga Parochial School, the Vecpiebalga singing and reading association was established on his initiative. Was the head of the association, also conductor of the choir. First poem – dedication to Garlieb Merkel (published in newspaper ‘Baltijas Vēstnesis’, 1869). Songwriter of popular songs ‘Vīra prāts’ (‘The mind of a man’) (‘Ozoli vēl Baltijā’ - ‘Oak trees still in Baltic States’) and ‘Svētku dziesma’ (‘Celebration Song’). From 1878 lived in Koknese, was the head of the Elizebete School. Brencis Preiss (1821–? ), participant of the Jaunbebri Potato Rebellion. The most active leader of the Jaunbebri farmers’ rebellion. Involved the people of Odziena parish in the rebellion. Viļums Preiss (1791–? ), participant of the Jaunbebri Potato Rebellion. Owner of the Apsīšu farmstead. Tried to persuade parish people to join the Orthodox Church – it was a peculiar form of Vidzeme farmers’ protest against German noblemen. Jēkabs Vickops (?–1842), participant of the Jaunbebri Potato Rebellion. Owner of the Jurču farmstead, one of the leaders of the rebellion. Was arrested after the suppression of the rebellion, died during his penalty. Rūdolfs Bangerskis (1878–1958), military worker, holder of the Lāčplēsis War order. He was the owner of the Koknese Bilstiņu mill. He was the general inspector of Latvian legion from 1943 to 1945. Ernests Blese (1892–1964), linguist, translator. Associate professor, German philology professor since the establishment of University of Latvia. Lived in Koknese’s ‘Laimiņi’. time’, 1932; ‘Summer of a Student’, 1931). She was attracted to her place of birth – the Dišleri family set up a summerhouse in Koknese and called it ‘Sauleskalns’. Jānis Endzelīns (1873–1961), linguist. The Department of Baltic Philology at the University of Latvia was established on his initiative and participation, as was a Philology association (1920), Endzelīns was the editor of ‘Filologu biedrības raksti’ (1921–1940) and created the Repository of the Latvian language (1935). Endzelīns first works were translations of poetry form Greek and Latin. He was recognized as a world level scientist in historically comparative linguistics. Endzelīns focused on the collection and research of toponyms, he published ‘Place names in Latvia’ (1–2, 1922–1925) together with A. Ābele, J. Kauliņš, P. Šmits and others, the edition was later continued by conducting extensive research for ‘Toponyms of Latvian SSR’ (1956–1961). His contribution was vital for the maintenance of Latvian literary language. Endzelīns published around 350 papers, including 15 books. Jānis Endzelīns lived in Bilstiņi farmstead ‘Nākas’. Jānis Peņģerots (also Jānis Peņģerots-Svešais, 1863–1932) – gardener, writer. Born in Koknese manor, he attended the manor school (1872–1877), then the Orthodox Parochial School. He wrote a lot on gardening. Published the books ‘Farmer’s Fruit and Berry Garden’ (1922), ‘Growing of Vegetable Seeds’ (1923). The son of Jānis Peņģerots – Visvaldis Peņģerots – art scientist, wife – Made Svile-Peņģerote – one of Kristīne prototypes in the novel ‘The Swamp Treader’ by Rūdolfs Blaumanis. Pērsietis (real name Kārlis Zemītis) (1862–1901) Graduated from the Irši Parish School, he studied in Vietalva Parochial School from 1878 to 1879, and sent his papers to newspapers ‘Baltijas Vēstnesis’ and ‘Balss’ already during his studies. Pērsietis articles were published in ‘Austrums’ and ‘Jauna Raža’’ lead by T. Zeiferts. Fables (signed as Mēlgalis) were published in 1899 collection ‘Paziņas’. He also wrote stories, poems and fables that gained popularity. Pērsietis is a true realist and describer of social life. Maid’, ‘Reptile’, cast iron — ‘Fauns’, this work of art can be seen in the Koknese castle park. There is Voldemārs Jākobsons museum in the farmstead ‘Galdiņi’’ in the Bebri parish.